Zoom allows you to schedule meetings with multiple occurrences, so that each occurrence uses the same meeting ID and settings. You can schedule these meetings in daily, weekly, and monthly increments. You can also set a recurring meeting to be used at any time. Meeting IDs for recurring meetings expire 365 days after the meeting was last started. For more info on scheduling meetings in general and all of the meeting settings, see our documentation on scheduling meetings. 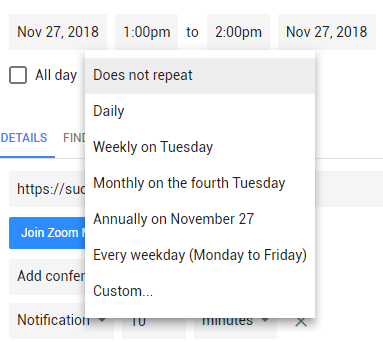 For a better experience, see the Zoom Scheduler add-on for Google Calendar (web or mobile) or Outlook (desktop or web) if you use one of these calendar services to schedule meetings. Visit our article about scheduling meetings to learn more. Check the Recurring meeting option. 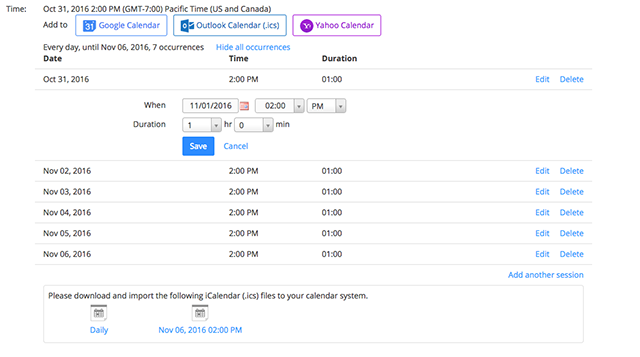 Click Schedule to open the calendar you have selected and set up your recurring meeting. Follow one of the sections below depending on your calendar selection. When prompted, sign in to Google. If you've already signed in, select your Google account. Click Allow to let Zoom access your Google account. Google Calendar will create a calendar event with the Zoom meeting details. In the drop-down menu below the date and time options, select the recurrence you want for your meetings. Finalize your meeting options and click Save. Note: You must have Outlook desktop installed on your computer for this to work. To set up a recurring Zoom meeting on the Outlook web app, check out the Zoom Scheduler add-in. Click Recurrence in the top toolbar. Change the recurrence settings, then click OK. In the dropdown menu below the date and time options, select the recurrence you want for your meetings. Log in to the Zoom web portal and navigate to My Meetings. Click Schedule a Meeting on My Meetings. Edit the recurrence. This includes the number of times the meeting occurs and how often it occurs. Note: Recurring meetings can have a maximum of 50 occurrences. If you need more than 50 occurrences, you can use the No Fixed Time option. Finish selecting the meeting options and click Schedule. 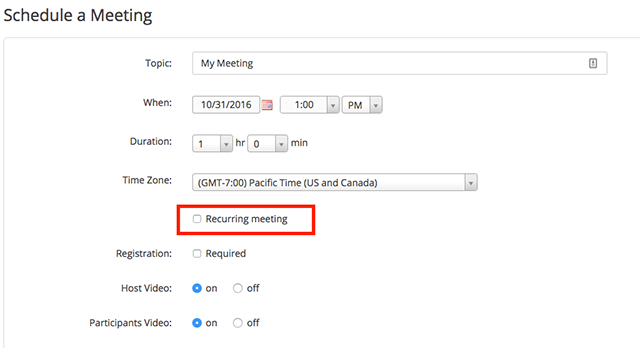 Follow these steps to add or edit single occurrences part of your recurring meeting. Click the topic of your recurring meeting. Click Show all occurrences next to the meeting's time. A list of all the meeting times will appear. You can delete or edit each meeting. You can also add another session in this section. Meeting invitations can be exported to a variety of calendars. Note: If you previously added the meeting to your calendar service, such as Google Calendar or Outlook, you need to edit the recurrence of the meeting through your calendar service. Click Edit this meeting. When asked if you want to edit all recurring meetings, click All. Note: If you previously added the meeting to your calendar service, such as Google Calendar or Outlook, you still need to edit the recurrence of the meeting through your calendar service. 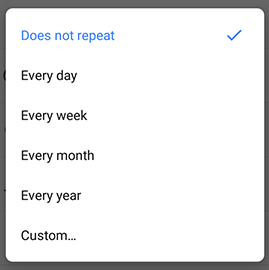 Tap the Repeat option and select a recurrence. Finalize the other meeting options. Turn on Add to calendar and click Schedule. Zoom will redirect you to your default calendar app and create a new meeting event. 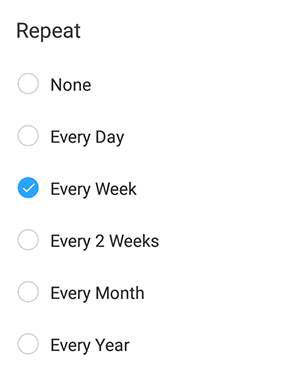 Below the date and time options, tap More options. Tap Does not repeat and select a recurrence option. Finalize your meeting options. Visit our article about scheduling meetings to learn more. 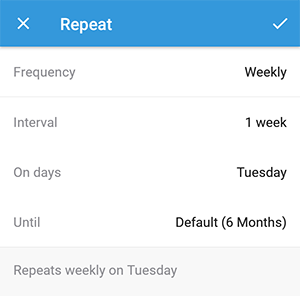 Tap Repeat, select a recurrence option, then tap the check mark.